Coupled with experience and support, we don't hesitate to share knowledge openly. We understand people need to learn and to accumulate knowledge in an un-biased and friendly atmosphere.Remember : Knowledge is for giving, but our Sport can be unforgiving!! 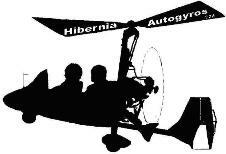 Hibernia Autogyros was founded in 2004. It was formed when the opportunity presented itself for a club to administer the permitting of factory and kit built gyroplanes. Given the interest and enthusiasm from individuals in Ireland and beyond for gyroplane flying, the formation of a new club was only a matter of time. The intention of the club also is to promote recreational flying for the earnest enthusiast who wants to fly factory and kit built gyroplanes. At present, the interest is expanding to a greater level than before. It is the duty of all members to promote safe flying! It cannot be over emphasised that initial dual training must take precedence, after which further training can be completed with a combination of dual seat and single seat training.